Apple's chief design officer Jony Ive in an interview published Friday offered perspective on why AirPods — like iPod and iPhone before it — has over the past months graduated from popular tech product to pop culture phenomenon. "I think this was common on the initial reaction to the AirPods — it's a reaction based on an academic understanding of them, rather than a practical daily understanding of them," Ive said. "What we tend to focus on are those attributes that are easy to talk about, and just because we talk about them doesn't mean that they're the important attributes. All that means is they're the ones that are easy to talk about." 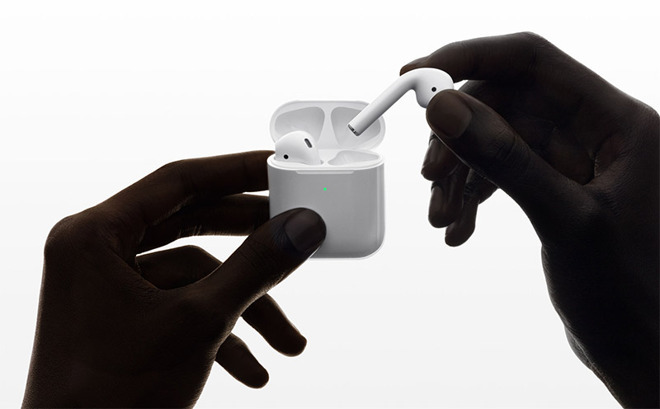 AirPods harness exceedingly complex technology — a custom processor and communications chip, optical sensors, accelerometers and beam-forming microphones — to present owners with a simple and intuitive user experience. Take the earbuds out of their charging case, stick them in your ears and they instantly activate, connecting to a host iPhone or iPad that was initially paired with a single tap. Beyond a pairing button that sits flush against the back of its charging case, AirPods lack physical controls. Instead, tap gestures, one for each earbud, trigger custom actions like answering a call or controlling audio playback. The rest is automated. AirPods respond to actions and movements made innate through years of muscle memory training — they pause when an earbud is removed, and playback automatically resumes when it is popped back in. Taking out both earphone simultaneously stops audio altogether.